The slowly improving U.S. economy and low interest rates have created a favorable environment for real estate investments. 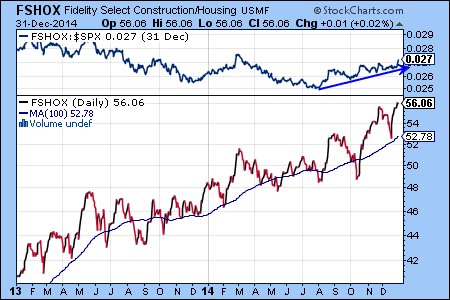 The Select Construction and Housing Fund (FSHOX) and the Real Estate Income Fund (FRIFX) are two excellent Fidelity funds, which allow investors to participate in this trend. The blue arrow in the top panel of the chart below shows that FSHOX has a positive relative strength compared to the S&P 500 index, because FSHOX has outperformed the S&P 500 index since August of 2014. 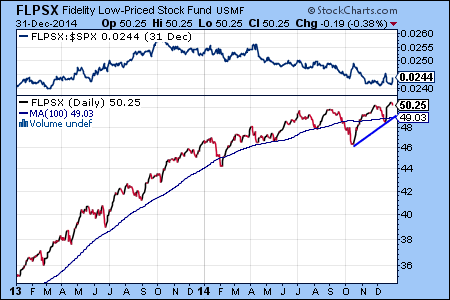 Similarly, FRIFX has outperformed the benchmark Fidelity Spartan U.S. 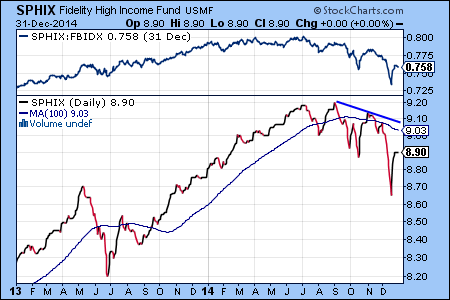 Bond Index Fund (FBIDX). 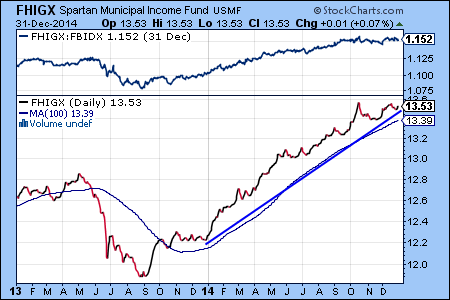 Two income funds that can outperform in 2015 are the Fidelity Spartan Municipal Income Fund (FHIGX) and the Fidelity Mortgage Securities Fund (FMSFX). The current yield of FHIGX is 3.54%, while FMSFX yields 2.49%. 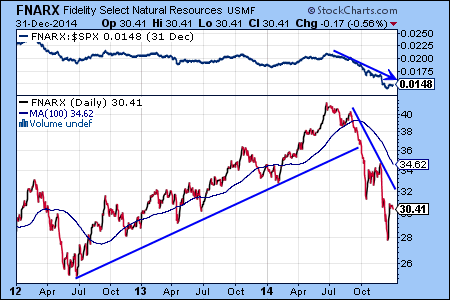 Investing in gold mining stocks can provide an attractive opportunity for portfolio diversification. 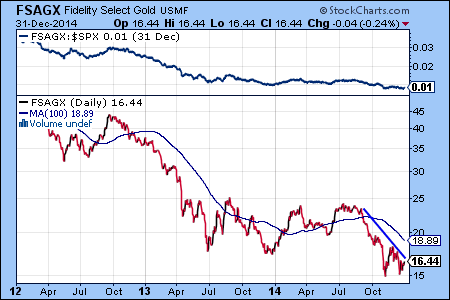 Of course, the best time to invest in the gold mining sector is when it is not declining. Unfortunately, that is not the case right now. However, should this trend reverse, the Fidelity Select Gold Fund (FSAGX) is an excellent mutual fund for investing in this sector. The history of the stock market shows that the weakest investments in one year can often become the best performing investments a year or two later. However, looking at natural resources and international stocks, the two weakest investments areas in 2014, we think that they likely to continue to decline in early 2015, therefore it is too early to accumulate an investment position. 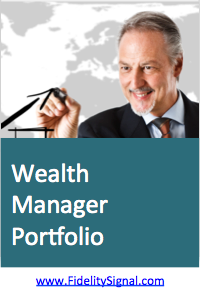 We highlight here two excellent Fidelity funds that can be used for portfolio diversification. The first is the Fidelity Real Estate Investment Portfolio (FRESX), which invests in large cap real estate companies, such as the Simon Property Group, Public Storage and Ventas. Lower interest rates will help these companies by lowering the borrowing costs for capital-intensive projects and will also make their yield more attractive compared to bonds. The three-year chart below shows that the net asset value of FRESX peaked out a year ago, which was followed by price consolidation in the second half of 2013. As interest rates started to decline in January, FRESX started a new uptrend and continues to outperform the broad market indexes. To make sense of the current market dynamics, let’s focus on the Fidelity funds with green arrows in the weekly column. These are the investments that both make the top 10 ranking and also have increased their rank compared to a week ago. In conclusion, while utilities and other defensive sectors are making gains, as well, the current market environment seems to favor natural resources and real estate investments. The chart below shows the inverse relationship between interest rates (e.g. TNX – 10-year treasury note yield) and U.S. bond investments (e.g. 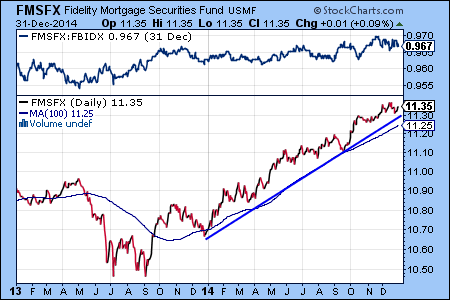 FBIDX – Fidelity U.S. 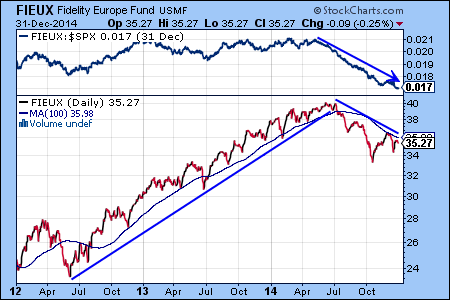 Bond Index Fund): rising interest rates have created a bear market for bonds starting in May 2013. Since interest rates are expected to continue to rise, this trend leaves few good choices for investors who are looking for income. 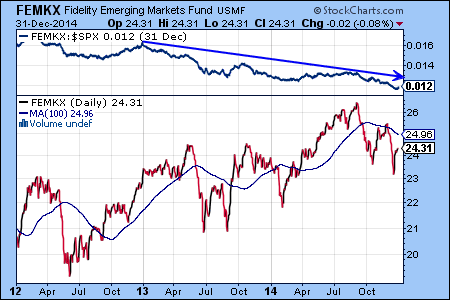 One possible exception is high yielding corporate bonds. We highlighted the Fidelity Capital and Income Fund (FAGIX), as an excellent choice in the current market environment (see article from November 14, 2013). 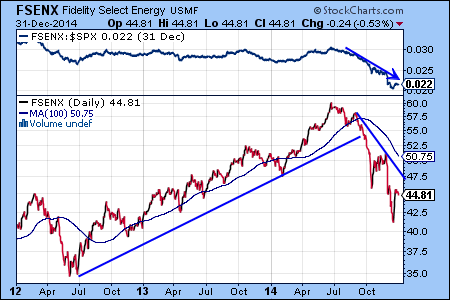 The chart below shows that FAGIX continues to perform well in 2014. 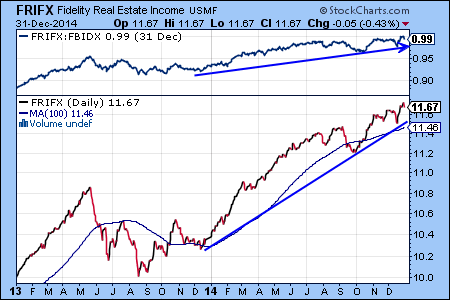 Today, we’d like to highlight the Fidelity Real Estate Income Fund (FRIFX), as another choice for income investors in 2014. 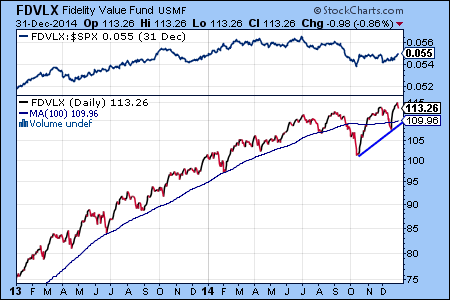 FRIFX is not a pure bond fund, but provides an impressive 4.82% yield. FRIFX invests in debt securities, and preferred or common stock of real estate companies. The current bond allocation is 42%, according Morningstar. The chart below shows that the long-term bullish trend for FRIFX was interrupted during the May 2013 correction and the price (net asset value) reached a low point in August. The price pattern has turned positive again in the last four months and we would not be surprised to see FRIFX resuming its long-term bullish trend in 2014. The Fidelity Real Estate Income Fund (FRIFX) is one of the best mutual funds available for investors who want to participate in the U.S. real estate market. 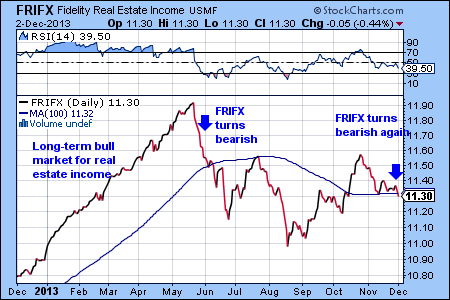 Unfortunately, the continued rise of interest rates has weakened the sector (see previous blog post) and FRIFX is not longer an attractive investment, at least until the real estate sector turns around.